The American flag that flies high above North Bay Industries’ beautiful Rohnert Park facility symbolizes more than just patriotism. That flag, made right here, is a testament to NBI’s mission to help adults with disabilities through vocational training and employment. 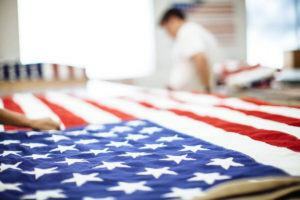 North Bay Rehabilitation Services, Inc. (dba North Bay Industries) offers employment programs that range from landscape maintenance, custodial services and, most recognizably, the commercial sewing operation that manufacturers premium quality American flags. Of course, every flag tells a story. But American flags from NBI speak to several important ideals. First and foremost, it speaks to a commitment to helping those in need. The flags are sewn by people with moderate to severe disabilities. In addition to providing employment opportunities, NBI has invested in affordable housing that’s within walking distance of work for employees. The housing allows persons with disabilities to live as independently as possible in the community. NBI is equally committed to keeping their operations local. The flags are made from 100% American-made materials, from the cotton to the thread. And, in keeping with their mission to help others, NBI has been manufacturing flags for the Department of Veterans Affairs for use as interment flags since 1994. Both the 5 x 9½’ interment flag and a 3’x5’ version are also available for sale to the public. Rewarding employees with the good life in Rohnert Park is yet another way NBI is making a positive difference in people’s lives. Based in Marin County until 1980, a company-wide survey showed that the majority of employees were commuting from Sonoma County. That’s when the NBI Board decided it would be best for employees if the company were to relocate. They looked in Petaluma, Rohnert Park, and Santa Rosa, but, as CEO Robert Hutt is quick to point out, Rohnert Park City management was willing to go the extra mile. NBI deepened their roots in Rohnert Park when, in 1999, they proposed a 24-unit apartment complex in close proximity to the offices. It was a great way to give their disabled employees the convenience and independence that comes from an easy walk to work. The City backed the project with enthusiasm and it went from concept to completion in 18 months. Today, 30% of the 172 employees at NBI’s Rohnert Park facility live here in town. It’s a warm and welcoming place for NBI disabled employees, with a range of entertainment and services within walking distance, and easy access to public transportation. The movie theatre is a popular attraction, as well as Art’s Place for employee lunches. Rohnert Park is proud to support NBI and their mission. We are honored that NBI calls Rohnert Park home, and offer our continued support of the organization and its admirable employees.